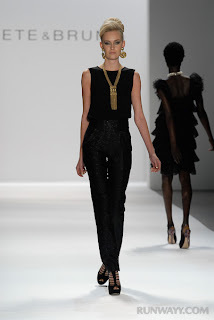 Italian designers Salvatore Prete and Filippo Bruno of Prete & Bruno made their debut at Mercedes-Benz Fashion Week at Lincoln Center for their Fall 2012 collection. Inspiration is drawn from old Hollywood glamour and timeless style of Marlene Dietrich and Grace Kelly. The collection ranges from wool and silk suits to dresses and wide leg pants in jewel tones and black, exuding a chic, modern elegance.